Nature is currently at its worst fury, as heavy rain is continuously pounding in Chennai and surrounding areas. The region is right now amidst worst floods ever recorded, as more than 250 people have died while affecting 1.8 million people. It is being estimated that more than Rs 20,000 crore worth of properties, livestock and crops have been damaged in these rains and floods. We can imagine the level of catastrophe as The Hindu was not published for the first time in the last 137 years of their existence, Army, Navy and Air force has been put on full force to evict flood victims and daily life has been completely crippled from last several weeks. During these times of distress, it is indeed heartening to see various brands and local businesses coming together, and pitching in with their help and assistance for the flood victims. – Paytm offered free recharge of any phone in Chennai, as they Tweeted: “Stay Safe Chennai! Call on 18001030033, recharge your friend’s phone for free http://p-y.tm/4Egc #ChennaiFloods” This was also shared on their Facebook page. At the time of writing, this Tweet had received 1243 re-tweets and 358 likes. – Vodafone, India’s 2nd largest telecom operator also offered help to victims to stay in touch with loved ones. They offered pre-approved ‘chhota credit’ of Rs.10 to all pre-paid customers and a credit of 10 minutes for Vodafone to Vodafone calling. In addition, Vodafone also offered free 100MB mobile data to all customers with data enabled handsets. 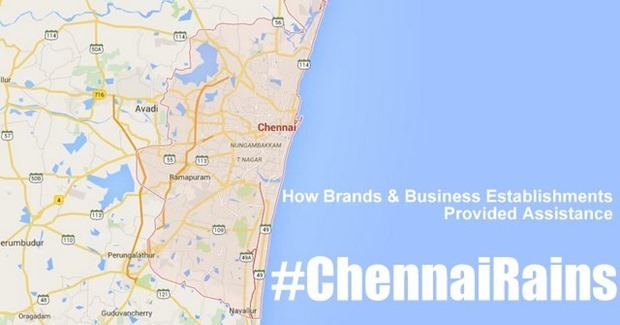 – Besides these, various local businesses in and around Chennai started offering their assistance. For instance, SPI Cinemas and AGS Cinema opened their doors for all flood victims. – Forum Vijaya Mall and Phoenix Marketcity also offered their premises for flood victims. – Various colleges, institutions and local eateries in Chennai also pitched in with whatever help they can provide. Special mention of users of various social networks, especially Twitter, as information was passed on quickly, and help and relief was sent out instantly as and when required. Such help goes a long way in such times of emergency and distress. Hats off to these brands and local businesses for reaching out to flood victims. "This Is How Brands & Business Establishments Provided Assistance To Chennai Flood Victims", 5 out of 5 based on 2 ratings.